Paul Tobin (left) of the United Spinal Association and Jeff Leonard of New Mobility celebrate the joining of their two enterprises. For more than 20 years, Americans with disabilities and their families and friends have come to rely on New Mobility magazine for news and features of interest to their community. The first-of-its-kind lifestyle magazine for people with mobility issues, New Mobility remains the leader in its niche. 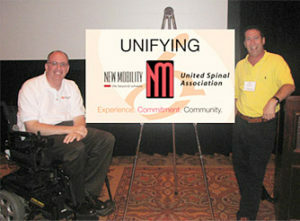 Now, in a move designed to strengthen the magazine’s role within the community, New Mobility will join forces with United Spinal Association to improve the daily life and outlook of those with mobility impairments. New Mobility grew from a few thousand subscribers to a readership of almost 20,000 subscribers under its ten-year affiliation with Leonard Media. Similarly, United Spinal Association developed from a small Veterans’ group of around 2,000 in the 1940s to a 12,000-member organization with a presence in all 50 states and a program of services that includes publications as well as advocacy.